Our clients in national and international markets can avail from us, a comprehensive assortment of Malleable Cast Iron Hand Wheels. These are known in the industry for their tensile strength, precise finish and cost-effective performance. 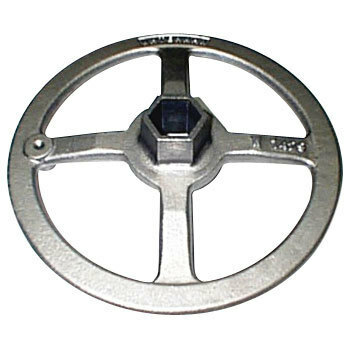 Due to these remarkable attributes, our iron hand wheels are used in several industries. Manufacturer of all types of quality Gears, Textile Machinery parts, Forge Valve Handles, Precision components, ll types of ferrous & non-ferrous Metal Casting, Graded Casting like S.G.I.,Ductile Casting, C.I. (all grades)and Malleable casting, Grey Casting.